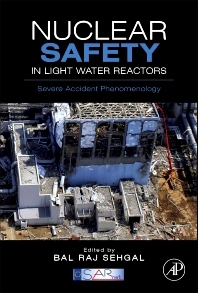 This vital reference is the only one-stop resource on how to assess, prevent, and manage severe nuclear accidents in the light water reactors (LWRs) that pose the most risk to the public. LWRs are the predominant nuclear reactor in use around the world today, and they will continue to be the most frequently utilized in the near future. Therefore, accurate determination of the safety issues associated with such reactors is central to a consideration of the risks and benefits of nuclear power. This book emphasizes the prevention and management of severe accidents to teach nuclear professionals how to mitigate potential risks to the public to the maximum extent possible. Dr. Bal Raj Sehgal is recognized as one of the top‐tier nuclear scientists in the world. He has contributed to the fields of reactor safety, physics, and engineering for 40+ years, through his involvement in R&D at two major US national laboratories (Argonne and Brookhaven), the Electric Power Research Institute, Purdue University, MIT, University of California at Berkeley and the Swedish Royal Institute of Technology. He is internationally recognized for his research publications, and for his many contributions to the profession, particularly in the realm of light water reactor design and analysis. Dr. Sehgal was appointed as Chair Professor of Nuclear Power Safety at the Royal Institute of Technology in 1991, where he initiated and developed a large research program on reactor safety, which is supported by the US, Sweden, Finland, Switzerland and the EU, and is considered to be one of the finest in the world. For the past 22 years, Dr. Sehgal has been active in the "Severe Accident" area, managing projects at major players such as Westinghouse, and General Electric, and serving as a reviewer to NRC and the OECD (CSNI). Dr. Seghal has lectured extensively at conferences and institutions across the globe, from Sao Paolo and Stuttgart to Beijing and Kyoto. Prof. Sehgal is active in the nuclear power safety community in the US, Japan, Europe and Sweden. He has been invited to provide expert review of the technical aspects of research programs from Italy to the US and Russia, and has coordinated several very large European Union (EU) research programs. Prof. Sehgal has published extensively over his career, having produced more than 360 peer‐reviewed papers and reports in various esteemed journals and conference proceedings. He served as the North American Executive Editor of the Pergamon Press journal "Progress in Nuclear Energy," and currently serves on the Editorial Board of Elsevier’s journal, “Nuclear Engineering and Design”. He has been the recipient of many prestigious awards from the American Nuclear Society, including the Glenn Seaborg Medal, as well as the Distinguished Scientist Award from the Japan Atomic Energy Research Institute. He was elected a Fellow of the American Nuclear Society in 1983, a Fellow of the ASME in 1998, and as the foreign member of the Royal Swedish Academy of Engineering Sciences in 2003.